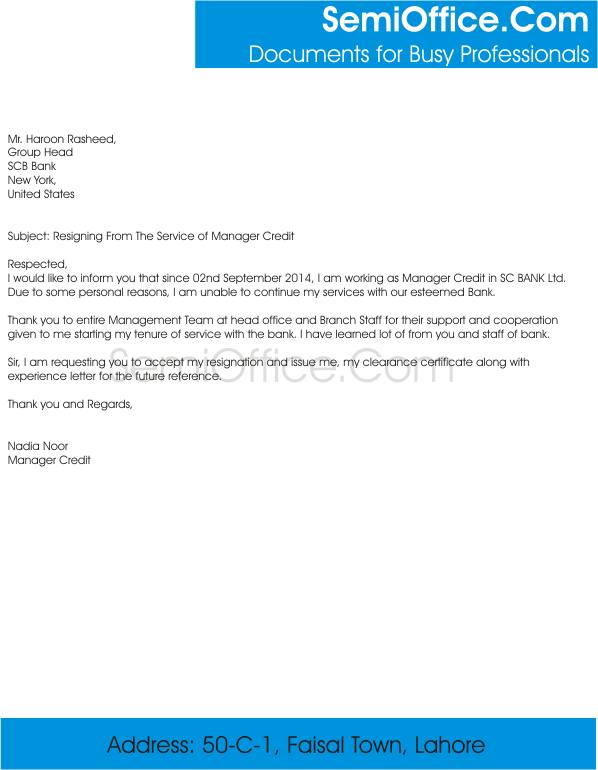 Sample resignation letter for branch manager, bank manager, production manager, sales manager, purchase manager and all other job positions of branch level. I would like to inform you that since 02nd September 20XX, I am working as Manager Credit in SC BANK Ltd. Due to some personal reasons, I am unable to continue my services with our esteemed Bank. Thank you to entire Management Team at head office and Branch Staff for their support and cooperation given to me starting my tenure of service with the bank. I have learned lot of from you and staff of bank. Sir, I am requesting you to accept my resignation and issue me, my clearance certificate along with experience letter for the future reference. I hope this letter will find you in best of your health. Sir I am writing this letter to inform you about my decision of resignation from the company. It was not an easy decision to make but I have to make it because I have an offer for a new job as a manager. I enjoyed working with your company and gained a lot of experience for my future career , working in your company was a boost to my career and I am thankful to you for your support and having faith in me. It is my request to you that kindly grant me an experience letter so that I can start my new job. I shall be thankful to you. With due respect I want to say that it has been 15 years since I have been working in this company. In this time, I have worked hard and with passion for this company. My behavior with others and my mutual relations with my colleagues have been good. I have done my every effort to make the company progress by using my knowledge and experience. From the day I started working here, I have been constantly trying to move my family to the city in which this company is situated. First there were some financial issues and now there some other personal issues. I have a daughter who is 2 years old. As I am far away from my family all the time, so I am unable to give due attention and care to my family for past few years. Now my family is in such a phase that it needs my presence at all costs. As I cannot afford to spend any more time without my family, I want to resign from the company. I have stated all the reasons for not being able to continue my job here. You are kindly requested to accept my official resignation and issue me a proper experience and recommendation letter. I hope you’ll consider my application under your kind consideration. I shall be thankful to you for this favor.